It was love at first sight when I first tried on a messenger bag. There's just no going back. The fact that I'm unencumbered without having to deal with straps that kept slipping off my shoulder or lugging a large tote while running after a young child was practically a revelation. I'm a fan of large bags only because I can't live without my camera, lens, water bottle, fat wallet piled with old receipts, snacks, packet of tissues, kitchen sink..... (just kidding). I think most are familiar with Heidi Klum's catchphrase in Project Runway - "As you know in fashion, one day you're in and the next day, you're out". Such is the way things are in the volatile fashion industry. In the past decade, we've seen plenty of IT bags come and go. Remember Luella Bartley's Gisele bag, Fendi Baguette or Chloe Paddington? The landscape of handbags has become so cluttered with the plethora of offerings that it can pretty confusing to pick the right one for you. If you're anything like me, you'll find it tiresome to keep up with the trends. I'd much rather spend money on one good bag and wear it for years. I want a bag that will last the distance, not just in terms of quality but style. Let's face it, no one wants to throw hard earned money down the drain. I've found from experience that classic bags which have been looked after generally have good resale value. Imagine using a bag for 5 years and being able to claw back half the purchase price if not more, which effectively help fund your next bag. I've been spoiled by my profession where I get to touch plenty of designer bags. I haven't been all that impressed with the quality of bags which usually do not correlate to the ridiculous amount they charge for. I often turn bags inside out because to me, good finishing denotes quality. Even stitching, proper lining and smooth edges with clean resin are amongst the 3 things I check for. If the designer has paid attention to the interior, you can be darn sure he or she would've made a greater effort on the exterior, materials and construction. The first on my list has got to be Hermes Evelyne. The PM and GM sizes are the most popular. I've worn mine for 6 years now through rain, snow or sunshine and it has never let me down. If I were to calculate cost per wear for my bags, the Evelyne would rate in cents now and the Birkin, well....let's not go there. Proenza Schouler PS1 is edgy, contemporary and ridiculously well made. The finishing is second to none. The lining is made of fabric which helps to minimize the weight. I love the fact that the bag looks fab whether you carry it on your arm or worn crossbody. I've owned several Longchamp Le Pliage bags in various sizes for close to a decade now. They've finally added the much needed strap to the leather version. One can't fault the practicality of the Le Pliage Cuir nor the affordable price tag. Miuccia Prada first introduced the her range of nylon bags made of tough military canvas in 1979 but it wasn't until 1985 before they became an "overnight" sensation. They're still so popular that Saks Fifth Avenue limits the number of these Prada bags that a customer can buy. I owned two which I used to death but they never seemed to age. The Vela Messenger bag is not the prettiest bag but it's literally unbreakable and perfect for travel or used a nappy or camera bag. Mulberry Postman's Lock Satchel is durable and rugged, both traits that epitomize the popular English brand. It's under the radar bag that is quietly classy without attracting too much attention. That Evelyne is a great bag, and if I go full-on messenger-style, that's likely the one I'll choose--hopefully the first version as the extra pocket seems too bulky for my tastes. As always, your collection is very inspiring! Another great post! I always enjoy reading your blog! Thanks so much for sharing. My favorite bag is the PS1! Hey I happened to visit your blog and I really liked it. Enjoyed reading all your wonderful posts :) Please visit my blog as well http://trimmingsandlace.blogspot.com/. It’s a personal style blog. If it interests, please feel free to follow me. I shall be happy to do the same for you. I've accumulated quite a few bags but generally try and stick to designs that I can use long term. My favourite in terms of quality has to be Dior, the stitching is superb! I do like Mulberry and in fact have 2 messenger style bags by the brand, but in my opinion the quality is just not as good as Dior. I do think that eBay has made it easier to rid one's collection of bags they no longer like. I really love the the H Evelyne and all leather Longchamp! I have a vintage Coach crossbody that gets a lot of wear and has stood the time of time! It's great to find a good quality bag! And I know what you mean - it's impossible to keep up with who's who or what's what in the handbag market! I agree with you on Vela(s), they never age! I had mine for years and it comes with me on my every trip and so far it has never let me down.. love the 'humbleness' of this bag. BUT I must say the Evelyne is divine.. (on my wishlist) and the rest are equally great! Usually I'm a Mulberry girl but I think I'm ready for a crossover to the Longchamp. And at less than half the price of the Mulberry - I'll take two please. What a perfect collection of bags. The Proenza Schouler is my favourite and of course I have a LOVE for Mulberry bags. The Hermes... well a gal can wish (especially after seeing yours). Just went back and looked at you "about me" - how fabulous that you run an online bag site. is it called Purse Addict? You really are the expert on this and so much is about actually seeing the purses. I love my Marc Jacobs satchel (camel coloured, never stains or scratches ) which is a smaller version of the satchel but its not deep enough and everything falls out everytime I put it down. One of those groovy Longchamps might do the trick! I do! I run an online consignment store but my email ID is purseaddict. I do suffer from a certain addiction to handbags. Well, and shoes too but that's another matter altogether. I'd love for Longchamp to introduce a whole range of colors for their le Pliages cuir range. 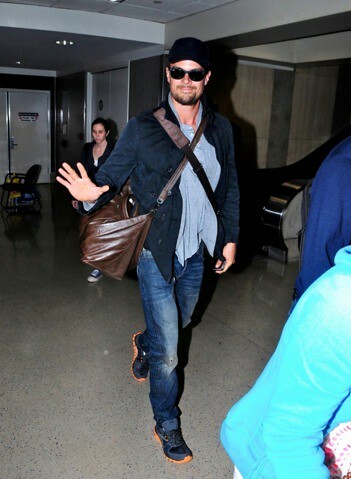 I am a huge fan of messenger bags, I have one that I have been using for 3 years that I wear with everything! And I love the bags you have here on the list, especially Proenza Schouler PS1. I have the Evelyne you have pictured on the Gossip Girl actress. 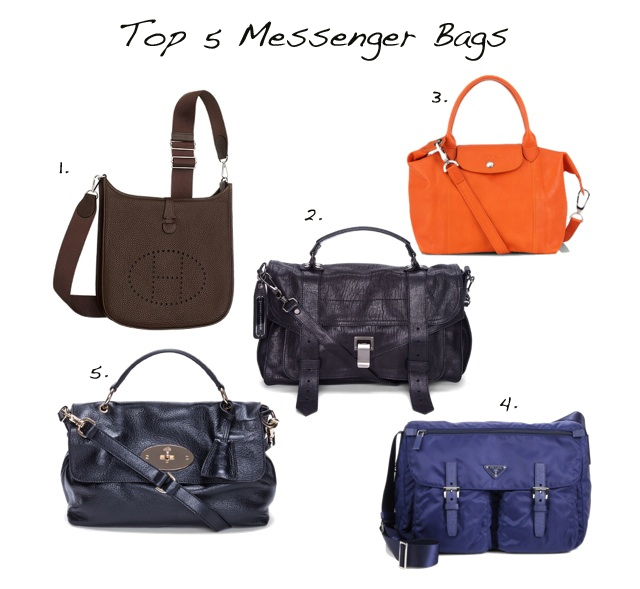 It is great for men and women and I agree about messenger bags overall. I fell for them once I put one on. I especially love the security of walking around with a cross-body bag knowing it is more secure. I have a special place in my heart for cross body bags. You are absolutely right, they are perfect for moms to stay unencumbered! I used to tote larger bags like a Balenciaga Part Time, but then started to get fatigued by the weight of it. I now carry smaller cross bodies like the LV Pochette Bosphore, Rebecca Minkoff MAC (although this is a little heavy from the thick leather and chain), or the small, flat version of the Prada Vela. I love the Longchamp leather bags, they are soo pretty. Do you happen to know how they are doing in terms of wear off? Because the le pliage are durable but the corners wear out relatively quick and I don`t really like that. But it`s such a pretty, pretty style! Anna, I think that's my one main concern. The corners are definitely slightly more padded because of the folds at the edges. I'd like to see Longchamp put extra reinforcements on them in the near future. I love messenger bags! As a vegetarian, I have a hard time finding quality leather-free bags. A brand I love is Matt and Nat, they make beautiful bags out of recycled plastic bottles! Thank you for the suggestion, Sascha. I have to admit that I don't know many well made faux leather bags. i love very much evelyne bag hermes !! I would like to buy it soon ! This has been my style of choice ever since we moved to NYC.... It's perfect for long days out and about exploring - I particularly like it as it leaves my hands free for my camera. Can't go past mulberry - I think that's my current 'next' bag! I own 3 out of the 5 bags you listed--> the Hermes Evelyne, the LongChamp Le Cuir and the Prada Nylon (but in another design). I was actually considering the Mulberry or PS but finally decided on the Longchamp Le Cuir due to price point. The Evelyne is one of the bags under Hermes which I like alot apart from Garden Party and Kelly. They are not just for men anymore! I love them and think they are so sharp! It's great to see them in C-O-L-O-R-S! I have been very fond of cross body bags for years now. Saw a lot of them worn in Paris in the late Eighties and it gave me a taste for them. I have bought quite a few from Agnes B in the past, but not recently They used to be incredibly good value, at around the £100 mark, but have gone up a fair bit. I always get asked about them when wearing one.